Darkest Before Dawn arrives Friday. Pusha T loves alliteration: his new song is titled “Crutches, Crosses, Caskets,” and the clip for the track is set on a creepy carousel. The rapper shares his carousel ride with some nuns who smoke cigarettes. Swordfish, my reality is more fish, he raps. Banana clips for all you Curious George’s. 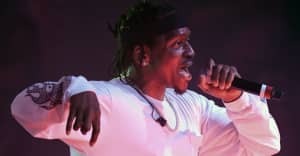 The MC shared the video on Twitter with the message: “I’m not big on surprises, but here you go.” Watch the Kid Art-directed clip above, and read Pusha’s FADER interview. Look for Darkest Before Dawn On December 18.